These feathered prints are very unique because each one is personally signed and comes with a real Australian Native Bird Feather attached to the bottom right hand corner. These works are supplied with a Government Permit and number that allows John to do this legally. 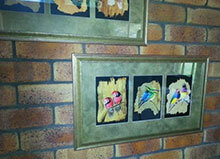 Each piece is supplied with a Certificate of Authenticity and profile of the artist. These Feathers are hard to obtain and have taken many years to collect. Feathers displayed on this website are examples only. No two are ever the same as each feather is totally different from another. Size 225mm w x 285mm h - 9 in x 11 in. Information About the Artist John Gray.